The basic elementary school in the New South Wales education system were known as National Schools from 1848 to 1866 and as Public Schools since 1867. Originally the attendance of 30 children was required for the establishment of a school, but this was reduced to 25 in 1867 and 20 in 1880; in 1957, when Provisional Schools were converted to Public Schools, the minimum figure was reduced to nine. Until 1875 parents had to pay one-third of the cost of buildings. 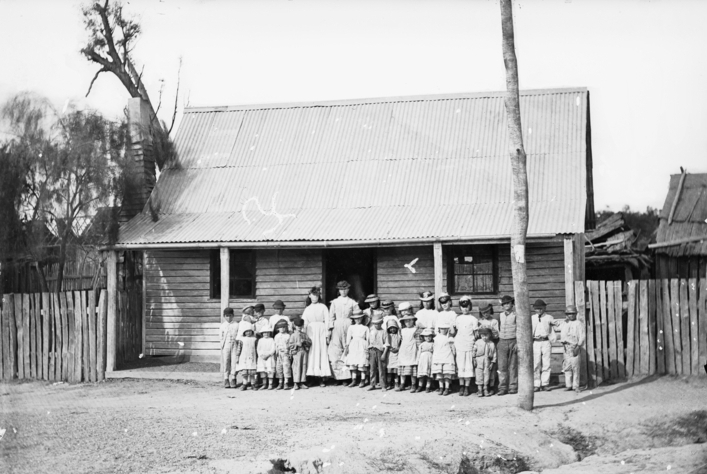 Before 1867 there were still schools in the goldfields area, with a number of denominational, private or “dame” schools looking after the basic educational needs of the children of the early settlers. However, by 1867 Henry Parkes “Public Schools Act” threatened to deprive the Church of the right to educate its children by withdrawing state aid. Existing Denominational Schools were allowed to continue for some time but they were gradually closed and Catholics were obliged to attend public schools or build and support their own. Evidence of some of these schools are preserved in the Holtermann collection of photographs at the State Library of New South Wales. Unfortunately, no records from these schools appear to have survived. Whilst there may have been other schools in the district before 1870, on 30 May of that year the first Public School was opened in Hill End and student admissions were recorded. The first 3 students in the “girls” register were the children of the teacher, Mr Alfred Page. The first 3 names in the “boys” register belonged to the children of Mr Seren Petersen, the local carpenter. It must have been a busy day in the school office that day, there were 106 students registered, 62 boys and 54 girls, ranging in age from 3 years to 15 years. A School Board was formed, as noted in the Sydney Morning Herald of 7 September 1870, when the Government Gazette noted the appointment of Messrs James Harvey, Joseph Paxton, James Wiseman Marshall and Henry Holston to the Board. The school in Hill End appears to have taken students as young as 2½ years of age and must have been more like a kindergarten than a class room. The eldest students to be enrolled were William Wallace and Elizabeth Kennedy who were still at the school when aged 17. Whilst schooling was compulsory the comments column often notes that the student, especially the girls, had left school as they were “required at home”. The public school was extensively expanded to cater to the increased population the year after it was opened, with further alterations and additions planned in 1877. However, by this time, attendance numbers had started to decline and it appears that these renovations did not fully go ahead. For two short periods (1881 – 1882 and in 1887) the school also opened as an Evening Public School where persons over 14 years of age, with little or no previous education, were offered two hours of elementary instruction three nights a week. The Denominational (Catholic) School in Hill End opened around 1870 with Mr. Donnelly from Wattle Flat as teacher and it operated out of the [old] Catholic Church. At the time of the laying of the Foundation Stone for the new Roman Catholic Church in Tambaroora the reporter for the Freeman’s Journal wrote, on 6 December 1873, of the success of the Catholic school, which, under the able teaching of Mr. James Donnelly and Miss Theresa Cummins was producing beneficial results amongst the children, the average attendance numbering about 100. In January 1873 there is a record of an application being made to the Council of Education for a new Roman Catholic Denominational School in Hill End. According to Harry Hodge, St Joseph’s Boys school was in Denison Street and the Convent School for Girls was in Tambaroora Street. When it closed the children attended the Public School until 1883 when the Sisters of St Joseph arrived. They continued to teach there in the Church and in 1885 there were fifty-three pupils enrolled. However, due to lack of support, the school closed again a few years later. Whilst we have a photo of the Wesleyan Church School, to date we have not been able to locate any information about this institution. It is possible that it was a Wesleyan Sabbath [or Sunday] School. If you can help about this or any other school, please contact us. As enrolments increased the building proved inadequate and the Sydney Mail of 21 July 1877 reported on moves to purchase the Protestant Hall, across the road, and convert it into a Public School. Mr. Morgan remained as teacher until 1878 when he was transferred to another school at Hargraves. The admissions register from 1889 – 1927 reveals that the school was enrolling children as young as 4 years of age. From anecdotal evidence (Mary Walpole’s diary) it appears that residents were informed that Tambaroora school would be closed around 24 March 1929 “forever”. An article in The Record of 1 October on the history of “Catholic Education on the Turon Goldfields” by Rev. P.J. Devlin, when discussing Tambaroora, provided the information in that “no Catholic School was ever there”. However, again we have pictorial proof of the existence of at least one private school which was located on the Mudgee Road. Sallys Flat School ran as a provisional school from its inception in February 1872 and as enrolments fluctuated it became a public school and then a half time school, sharing their teacher at various time with Rocky River, Lower Pyramul and Upper Pyramul. Half time schools were established to cater for children in areas of scattered population. The attendance of at least 20 children was required, in two groups of 10 or more. In 1898 the required attendance was reduced to 16, and by 1908 no fixed number was required. In a district where families came and went another source for the researcher is the school registers. School registers tell us a lot about the families who were in Hill End & Tambaroora and the surrounding districts. As well as the name and occupation of the parent or guardian, and their residence, we are also provided with their age at time of enrolment and their religious affiliation. They often provide an indication of when the families moved away from the district as well. The spelling of family names can sometimes vary as well so it pays to browse the lists if you are searching for ancestors. Copies of the following documents have been provided from a number of private collections. Our volunteers have transcribed and indexed these copies, which are often very difficult to read because of early copying methods. Whilst every attempt has been made to transcribe these documents accurately it is possible that there are instances where errors have been made. We welcome your corrections. For ease of access we have presented the registers from Hill End & Tambaroora in alphabetical order by the student’s name. Sallys Flat Register is smaller so has been left in date of admission order. Over almost 150 years of education there have been a considerable number of Teachers, of varying levels, who have been involved with the schools in the district. We have compiled a select list of headmasters, teachers, assistants and pupil teachers at schools from a number of sources, including 1870 – 1970 The Centenary of Public Education in Hill End by Bob Spencer with assistance from Harry Walpole, Hill End Family History Occupations File and various notes on Trove. This is by no means a complete list and the period given is approximate. If you can help with additional names and/or dates, please contact us. Educational methods have changed over the years and the inclusion of a page from the Hill End Public School Punishment book has been included to demonstrate this. Unless otherwise noted all illustrations are from the Holtermann collection at the State Library of New South Wales and reproduced with thanks.